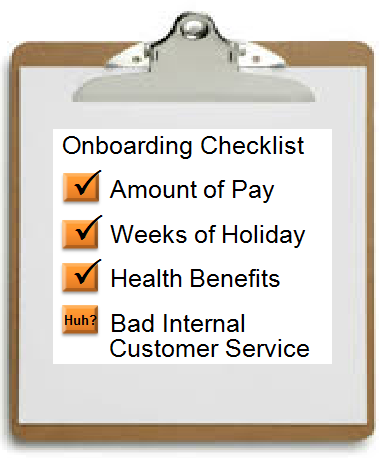 Service Management Journey: Wait, internal customer service has to be good too? Wait, internal customer service has to be good too? Your business has wants and needs. How you, as a service provider, satisfy their appetites will indicate how successful you are. In the not so distant past customers had to deal with lengthy wait times on phone support lines and long physical queues for assistance. Over time technology has enabled us to improve on the delivery of service to customers so why hasn’t the translation been made from the shared services to the business. Question - How is your internal organization serving your business? While these examples really apply to any shared service provider I choose to pick on IT as this is where I spend my time as an employee. Trust me this is not an IT issue, it is an internal service provider issue and I have experienced it first hand while attempting to get service from other shared services. To turn this around start thinking of service delivery like your business does. For them to succeed your business needs to be in a position to be scalable and adjust to the economic climate in which it exists. If they cannot meet customer needs and expectations someone else will and your business will be in trouble. IT service delivery needs the same ability to be agile and scalable to ensure they can provide the services the business needs to achieve its goals. Start by working with the business to identify the services they are using right now. Which ones are Critical, secondary or tertiary. Doing this will give you a sense of scope for your ongoing improvements. Keep the scope simple and target a few key areas for improvement. Ensure that these improvements are measurable so that you can share the success you are having with stakeholders in a quantifiable way. Communicate this information appropriately with stakeholders in a way that makes sense to them to keep the momentum going. There are many ways you can leverage people, process and technology to improve the delivery of service to your business but remember you need to work with your business if you are going to make any improvements which will be lasting and improve their ability to achieve.